Last edited by t4e; Oct 13th, 2008 at 20:35. 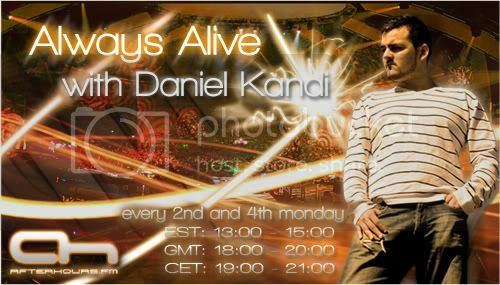 Remember to join the Facebook-group for Always Alive @ click here ! Last edited by z33k; Oct 13th, 2008 at 20:56. We've been waiting so far... www.InnerEmotions.tv... soon!!! Yeeeeeahh!!! 2 monday of October !! DAniel Kandi !!!! Yeeeeaaah !! Without EDM, life would be a mistake. Hey folks! Glad it's monday again!